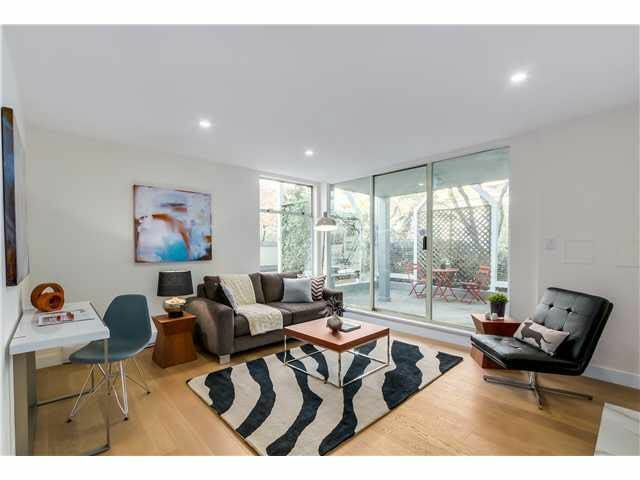 Most beautifully renovated, no expense spared, 1 Br 710 sf ground floor with 186 sf patio! Kenwood Court-steel & concrete mid-rise bldg. Upgrades include; German Eng hdwd floor, Kitchen-Porcelain floor tile w Ditra in-floor heating, Italian Gicinque Cabinets, Blanco Faucet, German 16 gage S/S sink w garburator, Krion Counter/Backsplash (new product to Canada), Samsung Appliances-Stove/DW/Fridge, Bath-Natural Stone Porcelanos w Ditra in-floor heat, Gemini Vanity, Kholer tub/toilet. New paint, baseboards, electric heaters, LED lighting/potlights, closet org, C02 & smoke detectors! Building partial rainscreened, plumbing completed 2010, 6 rentals allowed-currently 5, Guest Suite, pets allowed w permission. Open Sat/Sun Nov 22/23 2-4 pm.